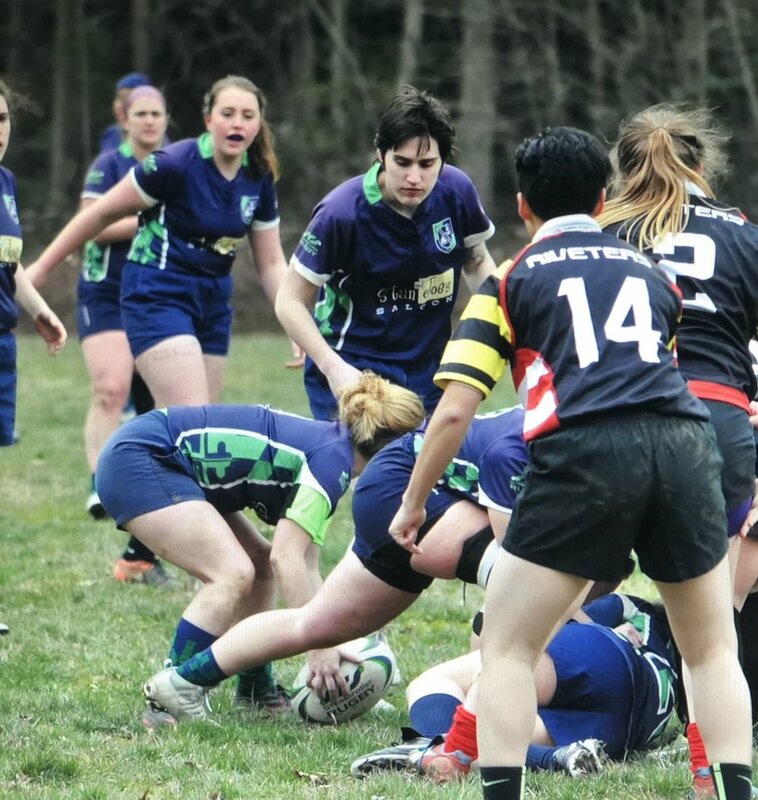 While others may have been enjoying $1 Guinness drafts and $3.17 corned beef and cabbage, the Severn River Men's and Women's teams wished a top o' the mornin' to their home pitch as they took on the men's and women's teams from Pax River. The women started the day with a 65-0 win over the Pax River Riveters. The Honeybadgers had a chance to stretch their legs after the long winter break with Mikey Williams leading the way in the pack. With three tries and at least four devastating stiff arms, she emerged from the winter hibernation ready to play. Aly Jost, in one of her few appearances at outside center, picked a pass in the back line and finished with a try in the middle of the uprights. Tina Schafer added two tries from scrumhalf, showing off her quickness and knowledge at this crucial spot. Lauren Scheidegger, new to rugby this spring, held her own at lock and proved her ability to ruck and support the team across the field. Her sister Beth and fellow newcomer Lily Folts worked hard to stabilize the pack and find their rhythm with their new teammates. More tries were added by Sammi Bottorf, Captain Casey Hartzell, and returning vet Kiki Elia. Rayne Trouwburst added four conversions and gave Mikey Williams the honor of adding one more at the end of the match. 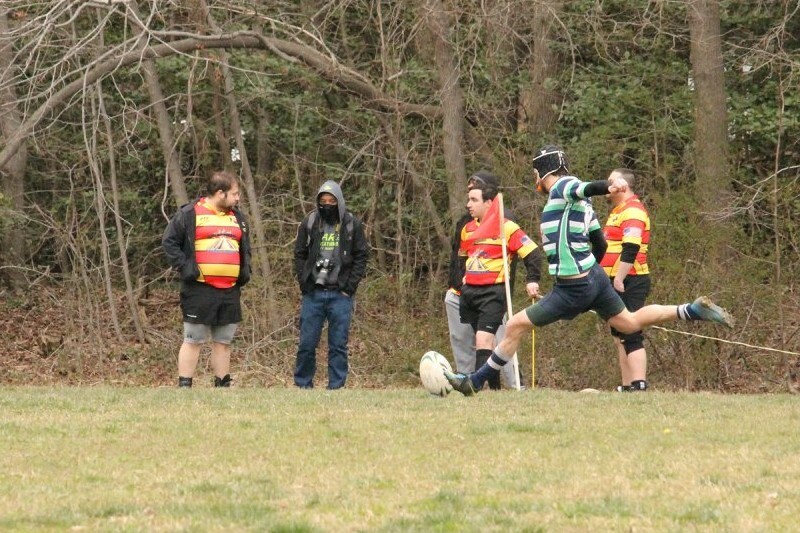 Severn River Men kicked off their 2018 spring campaign this past Saturday with a friendly match against D-IV side Patuxent River Lions. It was a St. Patrick’s day to remember for the boys in green and blue as they won in a rout, prevailing 83-12. Severn River’s experience and depth were key in the victory, and evident on both sides of the ball, with 10 different try scorers on the day, as well as holding PAX river to just 2 scores. The Gotimer family had a great day on the pitch with a first half brace from Harrison Gotimer, only to be topped by an eventual hat trick from his cousin, Colin Gotimer. Severn River also had first time Men’s side try scores from a trio of players. Brad McCarty, Cullen Bilger and Adam “Macca” McIntosh all scored their first try for the A-side in this week’s action. Severn had some highlights on the defensive side of the ball with several stolen line out set pieces as well as a try saving tackle on a breakaway near the 5 meter line by Mikhail Hershfeld. While not making it into the try zone, veteran leaders Erik “Punchy” Dronberger and Adam Dondero displayed their polished partnership at the 9 and 10 positions and kept the offense humming smoothly all match long. It was a great first step in their spring season and Severn River will look to continue their winning ways at home against Delmarva RFC this Saturday at 1pm.